As a part of your normal risk management procedures, when you receive an unrequested proposal you should ask yourself if it may be a scam. This page is a quick guide to help you identify the most common scams affecting the translation industry separated in two broad categories: scammers who want to steal your work and those who want to steal your money. Scam alerts will be generated to distribute scam information received, including risk management suggestions. ProZ.com members can Subscribe to the scam alerts . Past translator scam alert reports are available in a dedicated page. Scams in this area fall more in the field of normal risk management for freelance translators. They come from people who usually know about translation and are therefore more difficult to detect. This category does not include normal outsourcers who fail to pay because they run out of money (although risk management should also evaluate these cases). A scammer in this category is someone that will send you a translation assignment with no intention of paying you. There are two brad categories: scammers who will create a "ghost outsourcer" that will prove hard to track afterwards, and those that will misrepresent themselves as legitimate outsourcer, or acting on their behalf. The scammers will contact you asking for your professional services just like any other client would do, but they have no plans to pay you and will provide fake contact information to deceive you and to prevent prosecution. Your main line of defense against this kind of scams is a solid risk management procedure (one of the key elements you need to develop as a freelance translator). Validate the outsourcer's reliability with commercial services offering colleagues feedback on outsourcers, such as ProZ.com's Blue Board and several payment practices information providers. The scammers will contact you asking for your professional services impersonating a legitimate outsourcer. The first line of risk management (evaluation of the outsourcer) will give you the wrong information if you fail to notice that the request comes from a cheat disguised as the legitimate client. The main challenge in this case is to make sure that the person contacting you on behalf of an outsourcer is entitled to represent them. More difficult to detect are email addresses where a small change has been made to the dominion (for instance @big-agency instead of @big_agency). Calling the company asking for confirmation is a good precaution and a company should consider it a professional action. The worst situation is when the email address from a translator has been compromised or stolen by a scammer, who will then be able to ask you for a job from the legitimate address of a colleague without the email owner being aware of the scam. It is always a good idea to seek confirmation using a different channel (an SMS, phone call, Skype, etc). A variance of the stolen identity scam has the scammer allegedly acting on behalf of a known colleague to help him/her after an incapacitating blow such as a stroke or an accident). Be specially alert in there cases and don't forget to validate the situation through an independent channel. Scammers will send you a message apparently personalized (but in fact sent to many) promising an enormous amount in exchange for helping the scammer send a fortune (usually in the range of several million Dollars) out of their country (usually Nigeria or other African country). You are offered a large share of this fortune in exchange of their help. If you reply and agree to play along then you will be asked to wire some money because some paperwork is needed or some corrupt official needs to be bribed. If this payment is made new problems will arise requiring the transfer of additional "small payments that will enable the immediate transfer of the promised fortune". This will continue until you run out of money (or of patience), but some victims have been even enticed into traveling to the country (usually in Africa) to be kidnapped there. The relative of a deceased millionaire (usually a deposed dictator or someone killed in a dictatorship) who has access to a hidden inheritance. The executor of a large fortune belonging to someone terminally ill or already deceased, without descendants (next-of-kin variant). Scammer contacts you asking for your professional services. In may be the translation of a presentation or interpretation and/or language support during a business trip, either for the alleged visitor or for a relative that does not speak the languages. Scammer announces that payment will be via checks, traveler checks or money orders to be sent via email. Payment arrives promptly but the amount is much larger than the amount agreed upon. At this point the scammer will apologize for the administrative error and ask you to wire the difference either back to the scammer or to a third party. This transfer is requested via a wire service, usually via Western Union. The checks or money orders used to pay you are forgeries, or stolen and they bounce even if originally accepted by your bank and you lose the amount you sent back (and may also have legal problems because of the bad checks you deposited in your bank). In many cases the translation is requested for a presentation with the comment "so each participants can have a copy"
In this variant the scenario is similar and the amount of the payment is correct, but then the "outsourcer" contacts you apologizing for unexpected conditions that demand the cancelation of the project. You are asked to keep a generous portion of the money as compensation for the cancelation, and to send the difference back to the scammer or to a third party. Again you lose what you wired. Scammer approaches you with the promise of many good and well paid jobs. They can be a portal that has lots of leads from clients that need a translator that looks a lot like you, or else an agency eager to start enjoying the pleasure of working with you. Before you get access to this dream work you need to satisfy a condition that requires a payment from your part. Once you made that payment the promised jobs will never materialize. A website that will offer an unlimited amount of high-pay translation opportunities available to you even if your management of language is not so good. No experience required, because the need of translators is so high that companies are begging people to translate for them. Only a membership fee keeps you away from this dreamland and you even have a satisfaction-warranty clause to recover your money. Look for their physical address in their website. Search translators forums for experiences in this kind of sites. People report getting no jobs and finding a dead circuit when they ask for their refund. Scammer contacts you as an agency offering you good jobs on the condition that you need to be certified by a certain translation association you never hear of before. Membership in this association costs a considerable amount of money. Once you paid said membership you send the corresponding information to the agency and you sit down waiting for jobs that will never arrive. Scammer contacts you impersonating a service evaluation company such as Secret Shopper, allegedly to employ you as a tester of quality of the services of money transfer company, usually Western Union. You will receive a check,cash it, keep an amount per transaction as your fee and use the remaining money to make wire transfers to another contact in order to evaluate the service of the money transfer company and to report on them. The checks or money orders used to pay you are forgeries, or stolen and they bounce even if originally accepted by your bank and you lose the amount you sent in the "test transfers" (and may also have legal problems because of the bad checks you deposited in your bank). Scammer contacts you impersonating some legitimate colleague or client and reporting that, while abroad, his/her wallet was lost and (s)he needs help to pay hotel and other critical bills. Time is pressing because plane home leaves soon and you are asked to lend money (usually via Western Union), to be sent back as soon as this contact manages to get safely back home. The whole incident is bogus. The scammer has gained improper access to this legitimate contact's email address and has used it to send the transfer request. If you transfer the money it will be cashed by the scammer. 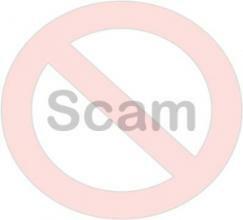 Scammer contacts you offering a golden opportunity of employment abroad. Salary and perks are very attractive and working conditions are described as ideal. If you reply to the mail you will receive even better news and at some point you will be told that some small payment is needed due to red tape. A typical example is the request that you send a given amount to an account in London, to be reimbursed to you on the next day, as a requirement from the British government to test solvency of applicant before issuing a work visa. Obviously this is a fake requirement and after paying you can say goodbye to the payment and to the employment. Sometimes payment in advance is offered. You could expect to receive checks in excess of the promised account, see "Advance Payment / Overpayment" above. Scammers create a fake personality complete with pictures (young and attractive), personality and history and then contacts you expressing interest in exploring a possible romantic relationship. If you respond they will try to correspond regularly, discussing family, job, shared passions and other issues designed to earn your trust and affection. Once the illusion of a genuine and meaningful relationship has been established, you will be asked for money, for instance to cover he cost of the airfare to meet you or a family medical emergency. If you comply you will receive further requests until the scam is uncovered. You get an email allegedly from a bank or other service provider claiming that due to some exceptional circumstance you need to reply supplying critical data to allow the supplier "to solve some critical problem that compromise the delivery of their service". The alleged reason may be congestion of service, changes of the operational environment, detection of unlawful activities, etc. The email may have convincing graphics that emulate the look-and-feel of the alleged institution. The links may ask you for your user name and password of your Internet bank account. The page is a fake created to steal your private information, that will be used afterwards for stealing from you or for impersonating you in order to steal from others. Some of the links can also direct you to dangerous places where you may get a virus or trojan. As a rule, no serious organization of any kind will ever ask you to provide your password.